One of the DFL’s more comical devices is calling themselves “the party of the people”. It’s always been a mixed bag, of course; currently, it’s the party of the people who try to make a career out of giving other people handouts, and the people who can exploit that system for more power for themselves. Which, admittedly, doesn’t exactly roll off the tongue, so I’ll give ’em a pass for not using it. But still, for “the party of the people”, the DFL is committed to quite a few stances this cycle that are diametrically opposed to what “the people” seem to want. As a result, they and the astroturf groups that do all of the DFL’s actual messaging these days – Alliance For A Better Minnesota, Take Action MN, Common Cause, the League of Women Voters, the unions and such – are busily cranking out a PR campaign to try to show that a minority, sometimes a teeeeeny tiny little minority, of the people are really a majority. Opposed to Election Integrity – The DFL opposes Voter ID. The DFL’s Astroturf Cabinet is making a lot of noise to cover the fact that between seventy and eighty percent of Minnesotans believe that voters should have to present some form of ID. There is no way to do this without lying, of course; Mark Ritchie’s statement that “700,000 voters would be disenfranchised” is baked wind; even if the number is accurate (and it is no more accurate than a Mark Ritchie election), the vast majority of them would be same-day registrants who could fill out provisional ballots while their identities were validated. …which, apparently, 700,000 Minnesotans are unable to do. That seems like a problem we’d hear about, doesn’t it? Right To Work: According to the Survey USA poll from a few weeks back, the vast majority of Minnesotans – 55-24% – support “Right to Work”, which essentially means that unions have to make a case to the worker for their dues; they won’t be required to pay dues to a union. The Astroturf Cabinet is trying to spin out of the jam two different ways; by comparing “right to work” states to “union” states in terms of straight-up per-capita income (as if New Yorkers earn more than Arkansans solely or even significantly because of unions), and the notion that wages drop in “right to work” states, which is very inconclusive at best, and offset by the fact that “Right to Work” states grow faster (which, again, isn’t entirely because they’re “Right to Work”; they tend to be red states, and they DO grow more). Stand Your Ground – earlier this week, four Democrats (Tom Saxhaug, Rod Skoe, David Tomassoni and Dan Sparks). broke with the Metrocrat majority to vote with the GOP on the “Stand Your Ground” bill, which would allow self-defense shooters to be innocent until proven guilty while on their property or in their cars. Some county attorneys and “police chiefs”, apparently unsure that they or their staffs could prove an unjust shooter broke the law, oppose the bill, saying it’d “legalize cold blooded murder”. The DFL’s handmaidens in the media are, on this issue, apparently too incurious to prod into some of the people they use as sources. And yet Saxhaug, Tomassoni, Skoe and Sparks no doubt remember ten years ago – the last time the DFL put itself on the opposite side of the Second Amendment movement – it cost the DFL, least outstate, dearly. The DFL’s opposition to Concealed Carry reform ten years ago played a pivotal role in costing it the House, and in driving the Senate strongly to the right; DFLers played a key role in passing the Minnesota Personal Protection Act. They did it because real Minnesotans supported it, and showed it at the polls. Nine DFLers crossed over to pass the original bill in 2003; it was much more than that in 2005 when the bill re-passed after it was struck down by a DFL pet judge in 2004. …even though the vast majority of informed people support it. Wilfare – Minnesotans oppose raising their taxes to increase the value of Zygi Wilf’s investment (or, in some cases, oppose raising their own taxes). But the DFL wants to divert money from the charities that get funding from charitable gambling to, again, give Wilfare to a billionaire whose only real goal is to inflate the value of his investment! But it’s not being talked about – anywhere. Least of all in the mainstream media, which profits handsomely from pro sports. How do you think Minnesotans feel about that? 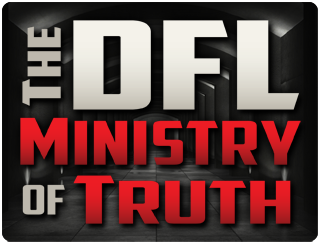 On issue after issue, the only consensus behind the DFL is the one their minions in the astroturf “Ministry of Truth” manufacture for them, and that their flaks in the media try to portray, provided one pays no attention to the Messinger behind the curtain. This entry was posted in Media Bias, Minnesota's Ministry Of Truth and tagged ABM by Mitch Berg. Bookmark the permalink. How many farmers and laborers are there in Minnesota, anyhow? All the DFL people I’ve heard of are lawyers, public employee union members, and social activists. Two weeks ago, Mitch and Ed were talking about Right To Work, when one of the hosts referred to union dues as “job ransom”. I was thinking how the left bastadizes our language (homosexuals are gay, killing the unborn is abortion, taxing and spending is ‘investing’), and I thought how good it is when somebody on our side can take a term (like ‘union dues) and call it what it really is.